How this outfit came to be Hattified: This dress was screaming Spring. 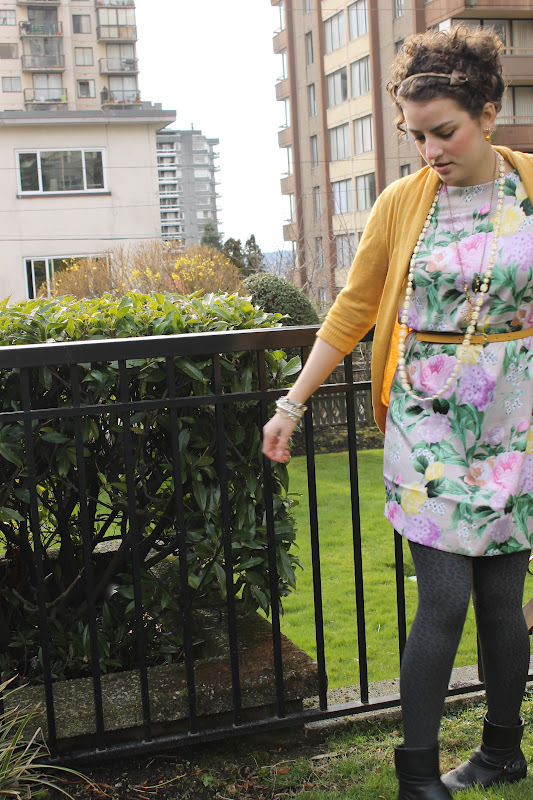 Since I'm in Whistler this week, I wanted to wear Spring one last time last weekend before I went in to winter wonderland. 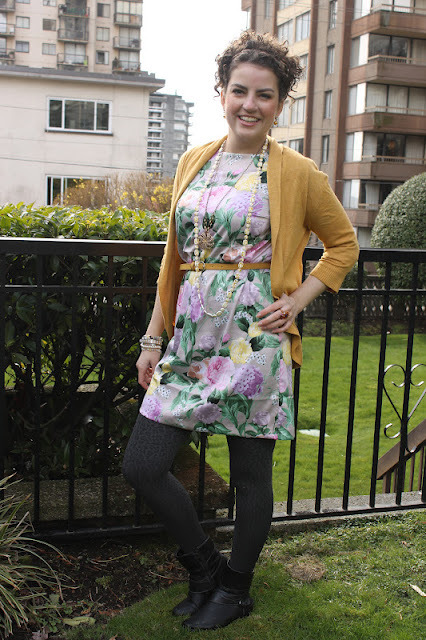 The dress wasn't enough, (I know right...one would think it was) so I added some patterned neutral tights. Why this outfit works: It has the rule of three, three patterns. 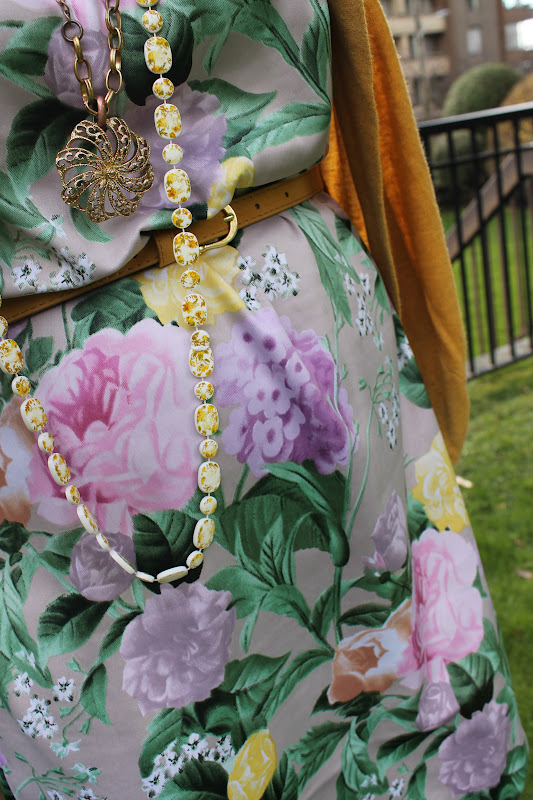 The one necklace has flower pattern in it, as well as the dress, which is quite bright, with neutral leopard print tights. It was a bit chilly, I tried a patterned sweater over top, but with the dress being really wild, I went with a plain mustard sweater over top. I threw on the second necklace to give it the third pattern. Another Version: Wear this dress with black tights, a black skinny belt, with a black blazer, with only one Hattitude necklace. My friend Carly from back home in Ontario came to Vancouver for a visit. It was so much fun having her here. We really did up the city and made her walk, walk, walk. We went to Whyte cliff park, which was absolutely stunning. It was almost unreal to see. I'll post photos when I'm back from Whistler. Tomorrow is a guest post from Ana. A cute spunky girl from California that I met through the online blogging community. Check back tomorrow and see her post. 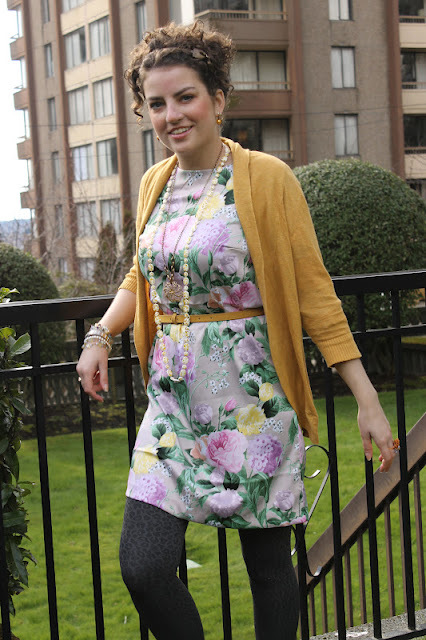 Have you entered my spring giveaway to win a free necklace?